Known as the “Golden Boy” before current WBC JR. Middleweight Champion Oscar De La Hoya was tagged with the nickname. 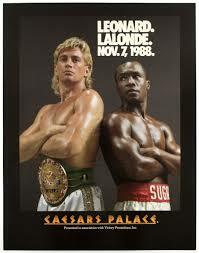 Lalonde had great charisma, and gave boxing fans many exciting performances. The “Golden Boy” took the time out of his traveling schedule to conduct an in-depth interview, and discuss many magical moments in his boxing career along with talking about his recent comeback to the ring that has been successful, and now sees him face former Light Heavyweight Champion Virgil “Quicksilver” Hill on July 5, 2003. The fight will be staged in Winnipeg, Canada and will be aired on ESPN2 along with Canada Pay Per View. BB: First of all, tell our readers what you have been up to since you had your last fight in 1998? Since my last fight in 1998, I have been working at liquidating my assets related to my real estate business in Canada. In my last fight, I damaged my hand quite seriously which I needed to rehabilitate and have had some very effective treatments enhancing the mobility of my left shoulder. My entire career has been limited by injuries I suffered in my left shoulder (in hockey previous to boxing) as well as my right hand which was improperly treated after breaking it in my 5th fight. Standard medicine has failed me terribly, but I have taken a chance on alternate medicine. I came across a soft connective tissue work which I have had tremendous success with. It is called Active Release Technique (A.R.T.) and it has assisted many world class athletes including Donovan Bailey (Track), Gary Roberts [hockey] along with my hand and shoulder. I have been learning A.R.T. in order to help others in need of soft or connective tissue rehabilitation. A.R.T. has been exponentially superior to any treatment or protocols of any orthopedic physicians or surgeons. BB:You now have been successful in your comeback to boxing. What are your goals this time around? Due to the fact that I am 42 years old I have to respect the fact that there are a number of questions which need to be answered before I can set too many goals in this comeback. I need to get into the ring and see what I have to work with. The questions of course are about my hand and shoulder as well as what effect the time away and my age will have on my ability to perform. If I am able to compete at a world championship level I would like to become the oldest fighter in history to become a World Champion. That would give me two years to prepare myself for this attempt. I want to enjoy the last amount of time I have left to compete in this sport and challenge myself to fulfill my highest potential with the luxury of having two hands to compete with. The difference that fans will see from my performances in the past is that I have a very clear understanding of the blessing it is to be able to make a living doing what one is truly passionate about and I will show this through a commitment unseen in me since before winning the championship the first time. They will see a “complete” fighter. One who has the ability to take ANYONE out at anytime with either hand. BB: In a boxing career that started in 1980, and was during an exciting time in the Light Heavyweight division. Discuss your thoughts on your era vs. today’s Light Heavyweights. In the era that I started my career in there was more depth, and a bigger commitment made by everyone. Today the fighters are generally better conditioned and they have good skills, but the commitment along with the willingness to sacrifice oneself for the outcome is less than it was back then. It takes a lot for anyone to put themselves in a boxing ring so I don’t want to sound disrespectful, but I don’t see the same sacrifice and commitment that I saw in the likes of Marvin Johnson, Michael Spinks, Mathew Saad Muhammad, and Yaqui Lopez. These guys were warriors that gave fans 100% of themselves every time out. I don’t see any of them out there today with the same HEART! BB: Looking at your fight record, I noticed early in your career you fought one of those memorable fighters of the early days of ESPN boxing. The fighter I am talking about was Wilbert “The Vampire” Johnson. Anyone growing up on ESPN boxing will mention him from the early years of the show because of those teeth. What are your recollections of those fights? It is the fight that started the problems with my right hand. I broke my right hand in the first round of that fight. The Vampire was actually a cagey and experienced fighter as an amateur. I boxed for the rest of the fight and thought I did enough to win, but the judges thought otherwise. He won the decision. He was a colorful character. Even during the fight he would be talking in a joking like manner. Because my hand was broken so early in the fight and I continued using it, the broken metacarpal was forced to compact itself as I hit it more during the fight. It was the improper treatment of that injury by the orthopedic surgeon that led me to alternative medicine. I was so upset at the loss that I barely slept until the rematch which couldn’t happen for 6 months because of the extent of the damage to my hand. In the rematch, I stopped the Vampire in the 2nd round, and became friends with the “Vamp” after that. I started to go down to Indianapolis where he was from to box with Marvin Johnson and the Vampire for a few years after that. I learned a lot from the Vampire in the following years! He was a memorable and colorful character of the times for sure! 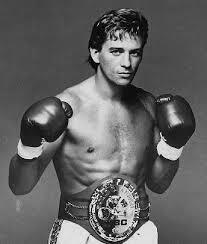 BB: You won the Canadian Light Heavyweight Title on July 4, 1983, when you stopped Roddy McDonald in the ninth round. Explain the importance of having a Canadian Title in your quest for a shot at the world championship? In regards to the winning of the Canadian Championship, I felt it was necessary to first conquer ones own domain before going after the world! It was a pride issue as well. Being the Champion of your own country carried a feeling of validation that allowed one to look beyond! BB: On May 7, 1987, you took a major step up in class and fought tough Mustafa Hamsho. You won a 12 round decision and this puts you in line for your first title shot. Discuss your recollections of this fight. This fight was very interesting to me on a number of fronts. First of all, of course the fact that it was a title elimination fight made its importance truly a chance of a lifetime and I was very aware that the time to show the fight community and my manager that I was for real and worthy of their time and effort. The other interesting element to that fight is that it almost never happened because I had so many injuries that prevented me from training effectively that Dave Wolf my manager and I gave serious consideration to not taking the fight. We were instead going to take a fight in the Ivory Coast of Africa as basically a retirement fight due to the injuries. About a month before the fight was to take place I had a severely swollen and chronicle painful joint in my left thumb. I had tennis elbow and needed to wear a brace to keep from extending my arm while training along with a neck injury that I just couldn’t shake. My left shoulder was very limited in its movement from two surgeries and many tears to the rotator. I also had a bad knee which affected my ability to run and a bad left knee which complicated everything. The worse injury of all was my right hand where the lining in the middle knuckle was split and therefore there was nothing to protect the nerve so I had excruciating pain whenever I landed the right. My massage therapist introduced me to a person who had developed a very effective body work that fixed my injuries and changed my life forever. I am able to fight at this age because of it and I have learned to help others heal their injuries that are not possible using convention medicine or re-hab techniques. To top all that off Hamsho was the dirtiest fighter of our time and he was not shy about throwing three foul combinations. It was an interesting fight in that N.Y. was his hometown, the Felt Forum was packed for the fight and ultimately I came out on top with the judges and most importantly with the fans. I believe that it was the turning point in my life and career in that I was accepted by the fans and people of N.Y. from that point on. BB: Later in the year, on November 27, 1987, you face veteran Eddie Davis for the WBC Light Heavyweight Championship of the World. Davis in his attempt at a Light Heavyweight Championship three and half years earlier, against then champion, Michael Spinks, he went the distance and he gave Spinks a tough fight. But in just two rounds you knocked him out. Why do you think you had such an easy time with him? I believe I was successful in stopping Eddie Davis because Eddie met me on probably the best night of my career. There was so much on the line for me to become Champion and I was still working with Ken Balson the guy that fixed my body for Hamsho. Ken also helped me get into the best shape of my life physically, mentally, nutritionally and personally. I was more focused and “in the zone” for that fight than any other one in my career. Dave Wolf did a masterful job in preparing my psychologically and I believe his commitment and faith in me had me willing to die rather than lose and with the focus, health, preparation and razor sharp right hand, Eddie was just in the wrong place at the wrong time. I am not sure honestly if there was a light heavyweight in the world that day that I wouldn’t have beaten. BB: What was it like winning your share of the Light Heavyweight Championship on foreign soil? Fighting in Trinidad added a special dimension to the fight. Though I was living in N.Y., and Davis was from N.Y. it felt more like a World title fight being in Trinidad than it would have say in Winnipeg or even N.Y.! The atmosphere was very interesting as well. A condition of the fight being in Trinidad was that the winner was obligated contractually to fight local hero Leslie Stewart in their first defense. This added a dimension of curiosity and interest to the fight that typically would not have been there. The winner was being set up to be devoured by the “Tiger” their name for Leslie. I thrived on the degree of intensity surrounded around the fight locally and building up to it. While running each morning on the streets of Port of Spain, the people would drive up and say things like “enjoy your time now because the Tiger is next and the tiger will eat you up man”. It was very fun to me! BB: In your first title defense on May 29, 1988, you went back to the Port of Spain where you won your title, and you faced former WBA Light Heavyweight Champion Leslie Stewart. In just five rounds, you also knocked him out. What are your recollections of this fight, and what brought you back to the Port of Spain for your second fight in a row? As mentioned in the previous answer the winner was contractually bound to fight his first defense in Trinidad against Leslie Stewart. That is why we returned there. The atmosphere was second to nothing else that I experienced in my career. There were Guard dogs on leashes and armed guards surrounding the outside of the grounds around the inner field. The worry was a riot if I won! The heat was intense, very hot and humid. I was very confident going in, but the atmosphere was electric and it felt like anything could happen. I loved the drama and the crowd being so in his favor only made me that much more focused. The fight was like a chess match with pieces that would blow up when hit. We were both cautious, but we were both throwing bombs when we made the commitment. I was hurt in the fight a couple of times and the heat was very effective in depleting my strength! There was a line of shade at about the halfway point of the ring. Our strategy was to stand in the shade and keep his back to the sun. It worked and gave me something to focus on with my foot work. The pace was fast and tension high but I stayed relaxed and just countered Leslie with power punches! It was my best performance ever. BB: On November 7, 1988, you are involved in the biggest fight of your career when you took on Sugar Ray Leonard. You had Ray down, but were unable to finish him off. In a gallant effort, you were stopped in the ninth round. In hindsight, what would you have done differently if you had the chance? The fight with Ray being at 168 lbs was good for me. I was forced to be very disciplined in every way in training. The problem was I came in at 163. The weight shows 167, but if you look at the tape of the weigh in you will see that I was wearing my clothes! I way over shot, I believe over trained and came in unprepared to stand up for 12 rounds let alone fight for that long. After the forth round I saw three of ray for the rest of the fight. I was VERY dehydrated going in. So I would have to say that I would have come in 5-7 lbs heavier and the fight would not have gone as long as 4 rounds! Easy to say now! But really I believe that. I would do it again today if given the chance! BB: If you had to pick one fight in your career that saw you at your career best, which fight would you pick and why? As mentioned in the answer of the Leslie Stewart question, I would have to say that that fight was my best. The variables involved and the calm patient way I went about fighting under all the circumstances around me made for the setting that made this my best performance. Calm, confident and focused are the words I would use. I was very well prepared thanks to my body workers, Dave Wolf, Tommy Gallagher and Bobby Cassidy. We were just on at that time! BB: If you could pick any Light Heavyweight from any era, to fight in your prime, who would you have picked and what do think the outcome would be? I would like to have fought Mathew Saad Muhammad. He was the ultimate warrior and would have been the ultimate challenge. There were more skilled guys like Michael Spinks and it would have been nice to fight him as well, but for an all out war, which I like, Saad would have made for the best fight. The outcome would have been many knockdowns, cuts, swings in the action and whoever was better prepared for that day would have won! That would have been the ultimate fight for me to have experienced. BB: What prospects out of Canada have you seen in recent years that truly impress you? Of course I under took the management of Dale Brown so I obviously was moved by him. I think Dale has just touched the surface of his ultimate ability. I hope he gets the title next week when he faces Jean-Marc Mormeck for the WBA Cruiserweight belt. This will give him an opportunity to really fulfill his potential by being challenged by the best there is. I am no longer involved in Dale’s career, but I see him as one that could really carry the flag for our country for a long period of time. I wish I was able to assist him in his career, but I sold his contract to Interbox and they have him now. If they can do him justice (which I believe they can) he will be a Canadian that everyone will remember. I definitely would favor a retirement fund for boxers. I think that a percentage from each event should be deducted and put towards the fund. After all it is the fighters that leave bits of themselves on the mat in order for the event to take place. Maybe an added cost to a ticket specifically defined as “fund” fee! The advertisers and T.V. stations should contribute a percentage as well each time they show the fights. As well the fighters should donate say 5% of their purses of over say $10,000. The boxing commissions regulate everything and should know about the purses, revenue sources etc. They should monitor and extract the money and be obligated to send it to the “fund”. Now the tricky part is: Who will manage the “fund”? BB: What advice in a boxing career that has spanned close to 20 years, can you pass on to the young boxers trying to reach their goal of winning a championship belt? The advice I would give to all up and coming fighters that have decided to make the commitment to become a World Champion is to be a sponge!! Not in absorbing punches, but in learning! Take a course in economics even if it’s a simple one. Watch everyone in the game to include the promoters, managers, and trainers. Learn as much as you can about your business. Learn as much as you can from every fighter and every trainer! Don’t just stay with one trainer, they all have different things to teach. Don’t quit your day job and prepare yourself for AFTER your career! It is MUCH longer than your actual career. But number one is to be prepared to put 100% of yourself into becoming the best you can be, be prepared to sacrifice everything except boxing in your life, and be sure that you have a manager that cares about you beyond $$$$. Do your own business until you are sure of the integrity of the person helping you! If possible get Dave Wolf to manage you! Don’t believe your own press clippings!! Do your road work and look for all alternatives when it comes to rehabilitating your injuries. Doctors diagnose symptoms and prescribe surgery or medicine, and they do NOT heal you!!! There are many treatments that can you can research and use them; it will give you HUGE advantages and years of health instead of discomfort and limitation! !